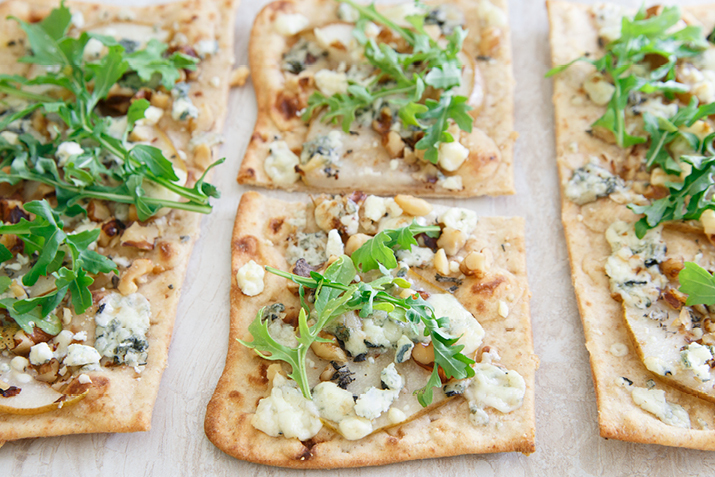 The classic combination of pears, walnuts and blue cheese shines in these delightful, easy flatbreads. Heat the oven to 450°F. Place the flatbread or lavash pieces on a large sheet pan and drizzle with olive oil. Spread the pear slices evenly on top, sprinkle with blue cheese, sage and walnuts. Bake for 6 to 8 minutes until the cheese is bubbly. Remove from the oven. While the flatbreads are baking, toss the arugula with the balsamic vinegar. Top the hot flatbreads with the dressed greens, sprinkle with black pepper and serve. Serve as an appetizer course, or with a hearty bowl of soup on a chilly evening. The combination of pears with walnuts and blue cheese is a classic! Substitute fresh spinach for the arugula if you prefer.